Purchase tickets online now for the Keystone State Boychoir Holiday Concert, performances Friday, January 4, 2013, 7:30 pm and Sunday, January 6, 2013, 3:00 and 6:00 pm. Find the Holiday Concert time and date you prefer listed on the Online Box Office page. Click "Buy" on the appropriate line. Advance tickets are $15, $20, $25, $50. Select the seats you prefer and the total and amount selected will be added to the "You select" area of the online form. When you have completed your selections, click “>>Continue." A new browser window will open to Confirm Your Selected Seats and you will be presented with a total for your order. Click "Continue to Check-out." You will be taken to the Online Box Office page for a final confirmation. Click "Secure Checkout>>." Complete the form to enter your credit card information and click "Secure Checkout." Print out the resulting ticket and bring with you to the concert. After your order is completed, click the link to print out your tickets on a printer. You must bring your tickets to the concert. Please contact Melinda Gervasio via email at mgervasio@cychoirs.org or call215.849.1762 with any questions. Thank you for your support, and we hope to see you at the concerts! In case you missed it, check out the live tweets from the St. Monica's Concert below. See the end of this post on how to follow KSB on Twitter. 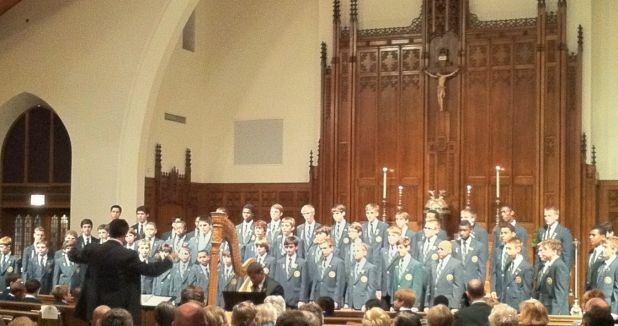 If you're not signed up for Twitter, you can follow us in your browser at http://twitter.com/ksboychoir/ or sign up here. Purchase tickets online now for the Holiday Concert on the Square, with the voices of Keystone State Boychoir and Pennsylvania Girlchoir! Find Holiday Concert on the Square listed on the Online Box Office page. Click "Buy" on the Holiday Concert on the Square line. Seats are general admission. Under "quantity" select the number of seats desired. Click “continue to check out." You will be presented with a total for your order. Click "Secure Checkout." Follow the prompts to enter your credit card information. Please contact Melinda Gervasio via email at mgervasio@cychoirs.org or call215.849.1762 with any questions. Thank you for your support, and we hope to see you at the concert! Sunday, 9 December, 2012 at 4:00 p.m.
Free-will offering. All are welcome! The Keystone State Boychoir, (KSB), founded in 2001, has enjoyed unprecedented success for an organization so young, and is recognizedtoday as one of the finest community-based boychoir programs in the world. InOctober of 2011, KSB celebrated the milestone of its 10th Anniversary Season bybringing together for the first time all of the the region's boychoirs and morethan five hundred local boy singers on stage in Verizon Hall for B1K! -Boychoir of 1,000! KSB consists of more than 170 young men between the ages ofeight and eighteen who sing an enthralling repertoire from the classical to thecontemporary. Major choral works that KSB has performed include Bach's St.Matthew's Passion, Orff'sCarmina Burana, Handel's Messiah, Mendelssohn'sElijah, Britten's St. Nicolas, and the Fauré Requiem. In January 2013, KSB willcelebrate the 100th Anniversary of Benjamin Britten's birth by performing thecomplete A Ceremony of Carols with KSB alumnus and harpist Jordan Thomas. KSB has sung with the region's most distinguished ensembles,including the Philadelphia Orchestra and the Opera Company of Philadelphia, forwhich it serves as its official boychoir. KSB has appeared in the area's mostprominent venues including the Perelman Theater and Verizon Hall in the KimmelCenter for the Performing Arts, the Academy of Music, and the Mann MusicCenter. Internationally, KSB has performed in major concert halls, includingthe Manaus Opera House in Brazil, the Petronas Philharmonik Hall in Malaysia,and the Hanoi Opera House in Vietnam, as well as in venues throughout Canada,Brazil, Chile, South Africa, Japan, Thailand, Cambodia, Vietnam, Malaysia,Australia, Monaco, France, Germany, Austria, Bulgaria and Norway. In December of 2009, KSB made history as the first choir totravel to and perform in Antarctica. In doing so, KSB became the first choir tohave sung on all seven continents. In July of 2012, KSB made history again whenit travelled above the Arctic Circle to Svalbard, Norway - the most northernsettlement in the world. There KSB sang in the northernmost church and theatreon the globe. The KSB experience is one of truly joyful music-making. Thevibrant sound of the choir is enhanced by its compelling stage presence. TheMusic Directors believe that today's choral music should be felt and seen, aswell as heard, if the art form is to thrive. They have found that when theunique energy of boys is channeled into choral singing of the highest standard,the result is unforgettable performances for audiences and singers alike. Keystone State Boychoir, its sister-choir the PennsylvaniaGirlchoir, and their school outreach program Find Your Instrument! aremember-choirs of Commonwealth Youthchoirs (CY), founded by Joseph P. Fitzmartinand Steven M. Fisher. CY is a non-profit organization that is committed toproviding superior choral music education and performance opportunities for youngpeople from diverse economic, racial, and ethnic backgrounds. Visit usatwww.keystonestateboychoir.org. Chester, PA - The world-travelled Keystone State Boychoir (KSB) only has to go as far as Chester, Pennsylvania next week where it will perform at Widener University’s Multi-Cultural and International Week. KSB will take the stage on Monday, November 12 as a part of the university’s celebration of world cultures. The concert will take place at 7:00 pm in the Alumni Auditorium. The concert is free and open to the public. KSB is the perfect fit for this event as the only choir in the world to have toured all seven continents. In 2009, KSB made history as the first choir to perform in Antarctica. More recently, KSB sang at a ceremony in Oslo, Norway for Nobel Peace Prize winner Aung San Suu Kyi and presented her with a Liberty Bell. Internationally, KSB has performed in the world’s major concert halls, including the Manaus Opera House in Brazil, the Petronas Philharmonik Hall in Malaysia, and the Hanoi Opera House in Vietnam, as well as in venues throughout Canada, Brazil, Chile, South Africa, Japan, Thailand, Cambodia, Vietnam, Malaysia, Australia, Monaco, France, Germany, Austria, Bulgaria and Norway. The repertoire of KSB includes songs that range from the classical to the contemporary, and world music from Broadway to South Africa. It is a unique experience to not only hear but also see KSB perform, as audiences are moved by the boys’ compelling stage presence. At Widener University next week, KSB is part of a world celebration that includes a French Cabaret, Salsa lessons, a bazaar by the Saudi Arabian Student Union, a multicultural fashion and talent show and more.Chartered in 1821, the prestigious university, with more than 3200 undergraduates and 1700 graduate students, draws students to its 110-acre campus from 26 foreign countries and 22 states. KSB brings together 170 boys, ages 8-18, under the direction of Joseph P. Fitzmartin and Steven M. Fisher. 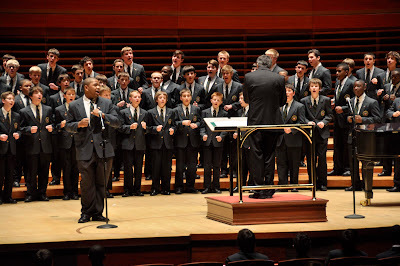 The Keystone State Boychoir encourages and welcomes boys of all experience levels to audition for the choir. Boys interested in auditioning may do so immediately after this concert. To schedule an audition at another time, you may email Martha Platt at mplatt(at)keystonestateboychoir.org or call 215-287-3142 or visit the website at www.keystonestateboychoir.org. 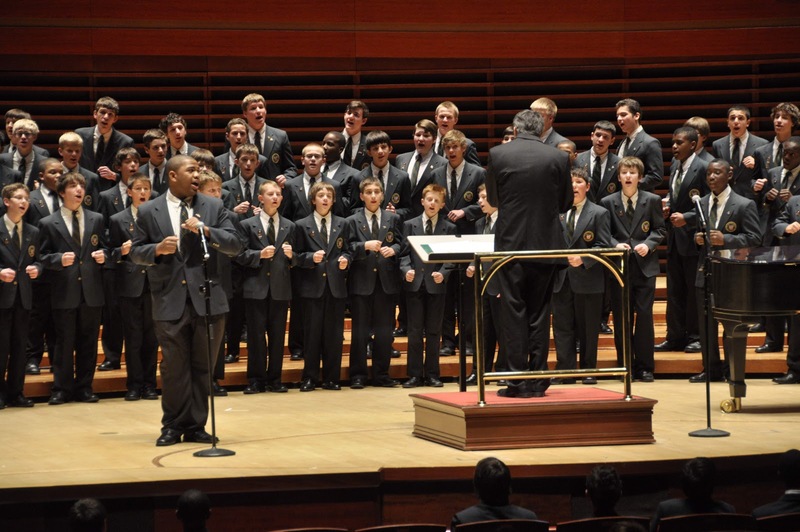 York, PA - Do not miss Keystone State Boychoir (KSB) when it brings the house down this Friday at the American Choral Directors Association of Pennsylvania’s (ACDA-PA) Fall Choral Conference. KSB has been invited to take the stage as the opening performance at the prestigious ACDA-PA conference in an open-to-the-public concert at Zion United Methodist Church in York on Friday, October 19 at 8 pm. Tickets can be purchased at the door for $15. Of course, no boychoir tour to York would be complete without a visit to nearby Hershey Park. The boys are excited to eat chocolate and ride roller coasters almost as much as they are excited to sing for the conference attendees. Audiences are always moved by KSB’s angelic sound, as well as the boys compelling stage presence. 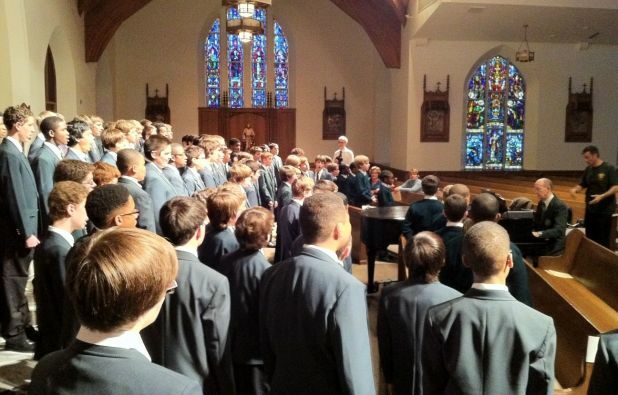 Known as “Pennsylvania’s Boychoir,” KSB has garnered unprecedented success since its inception in 2001 and is considered to be one of the finest community-based boychoirs in the world. KSB has 170 members who range in age from 8 to 18 and come from a range of backgrounds and counties in Pennsylvania including Delaware, Bucks, Montgomery and Philadelphia counties. The conference next week for the ACDA-PA brings together singers, composers and conductors who share their choral talents in a weekend of events. The ACDA is a non-profit that represents 18,000 choral directors and more than a million singers in the United States whose goal is to bring excellence in choral music through performance, composition, research and teaching. Philadelphia - Sixteen boys from the Keystone State Boychoir (KSB) are performing on stage at the Academy of Music in the Opera Company of Philadelphia’s (OCP) production of La Bohème. KSB, together with its sister-choir Pennsylvania Girlchoir, serve as the official children’s choir of OCP. Twelve girls are also part of the production. ​The boys performing in the opera come from neighborhoods throughout the city and the surrounding suburbs, some as young as 11 years old. They have been attending rehearsals since August, learning to sing in Italian alongside the opera's stars. Last week, they were excited to be fitted for costumes (see picture below). La Bohème is a melodic, heart-warming love story of a shy seamstress and a passionate poet that takes place in a bohemian Paris of the past. ​​KSB brings together 160 boys between the ages 8 and 18 to sing a wide-ranging repertoire of music from classic to contemporary. Under the direction of Joseph P. Fitzmartin and Steven M. Fisher, KSB has been lauded around the world for their superlative musicianship and engaging stage presence. 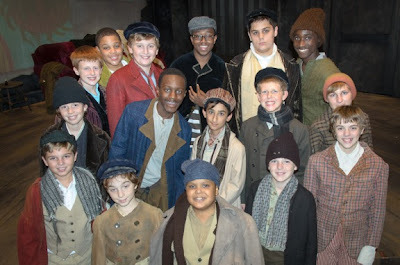 Recently, KSB made its Broadway debut in a performance of "Oliver!." In 2009, KSB made history as the first choir to perform in Antarctica. 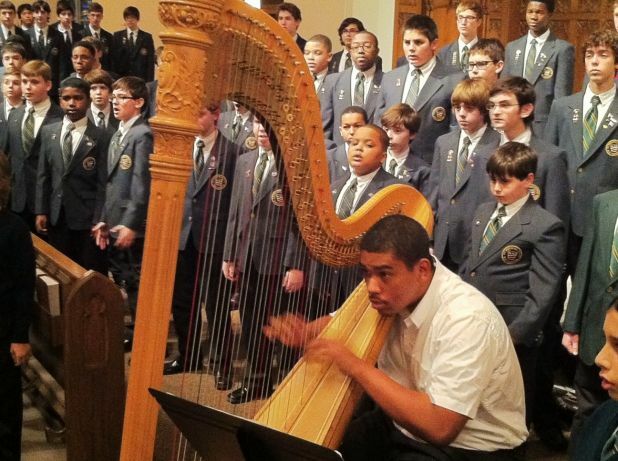 The Keystone State Boychoir is seeking new members for their 2012-13 season. Boys of all experience levels are welcome and encouraged to audition. If you are interested in auditioning, email mplatt (at) keystonestateboychoir.org, call 215-287-3124 or visit our website at http://www.keystonestateboychoir.org. La Bohème is being performed at the Academy of Music on October 3, 5 and 7 and will be presented in a free, big-screen HD projection of La Bohème on Independence Mall on October 6. Sixteen members of the Keystone State Boychoir pose in costume as they get ready to perform in the Opera Company of Philadelphia's La Bohème at the Academy of Music.